Working for the Mountain Monthly has interesting benefits. Area media gets certain privileges that I was the happy recipient of last month. The Friday before the Holloman Air Force Base air show I had the extreme pleasure of flying in a 1943 DC-3. At one time this particular plane carried England Royalty and Winston Churchill. 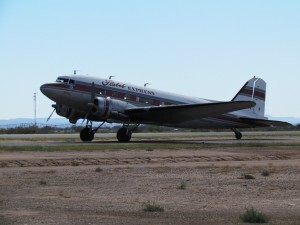 The historic 1943 DC-3, read for takeoff. Photo by Debra Schilling. It didn’t take long to say “Yes” when asked if I would like to take advantage of this FUN opportunity (fun is my description). I told my husband about the offer,”I get to take a ride in a 1943 DC-3 aircraft this Friday, what do you think”? “Yeah, and if you don’t, tell them I will”! I arrived at the Alamogordo Municipal Airport Friday morning® to meet up with others who were going to ride the aircraft. We all walked to the hanger and waited for our departure time to come. I must admit I was a little apprehensive while we waited. Several other aircraft were there, all looking very sturdy, but old none the less. Our time arrived! We walked out to where the air craft was being fueled. As we got closer and I saw the propellers on each side of the wings, my mind went to W.W.II movies I’ve watched. Men in jump suits with a white scarf blowing in the wind. 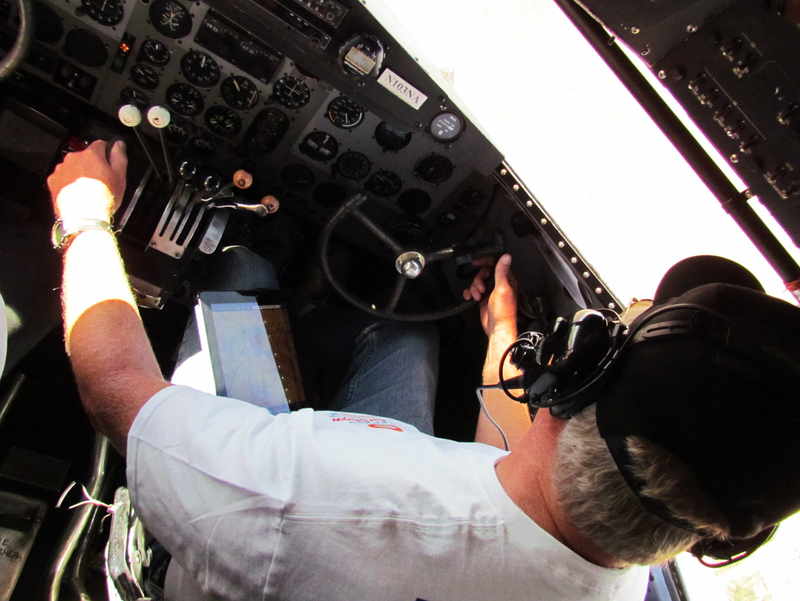 We were informed by our contact person, Arlan Ponder, that only seven of us would be able to take the flight. I was one of those seven. YAHOO! The pilots did a great job of handling the historic aircraft, even in gusty winds. Photo by Deb Schilling. We boarded the air craft. It had a row of seats on each side of the plane with two seats in each row, an isle in the middle. All seven of us were instructed to sit in the front of the air craft for take off. After we were airborne we could unbuckle, walk around to take pictures. That was not as easy as it sounded. It was very windy outside and the plane would dip and rise, then dip and rise again. I found it easier to stay on my knees while taking pictures in the back of the plane. I’ve flown many times, all around the world, and every time the scene below is just as breathtaking as the first flight I took at thirty five. The expanse of White Sands National Monument with the Organs in the background is something to see. The city of Alamogordo seems so small and neat, tucked into the foothills of the Sacramento Mountains. 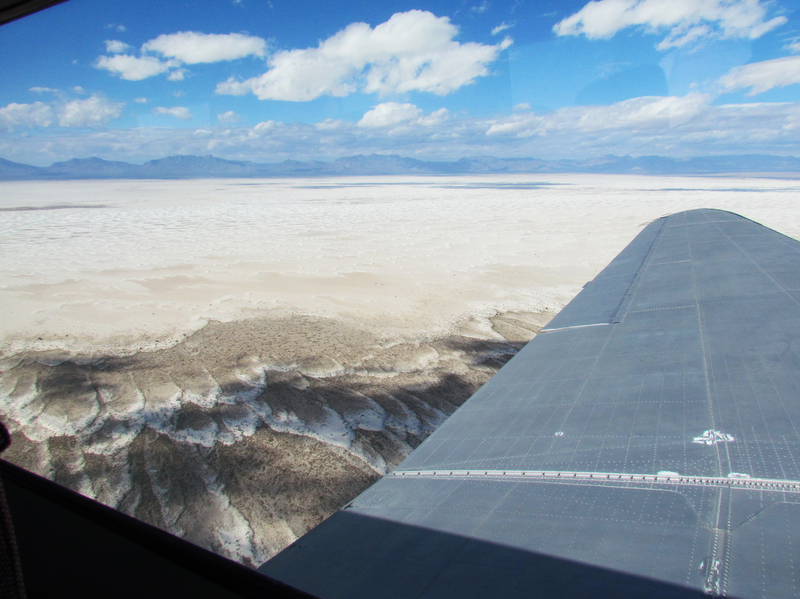 The view of the expansive Tularosa Basin as the plane flew from one mountain range to the other. Photo by Deb Schilling. We flew from one mountain range to the other. Such a beautiful place we live in. The mountains looked strong and majestic, protectors of the valley. After a while I started to feel a little queasy. The dips and rises were becoming more frequent and I had to sit for a while. The winds were picking up and we headed toward the air port to end our trip. As we made our decent it became evident the winds were giving the pilots a test of their abilities. We touched down on the runway several times, the last swerving the back wheels off the runway into the sand. The pilots never lost a beat. The aircraft fishtailed slightly and moved itself right back onto the runway and to our destination. A little drama was exciting! I was glad it was after we landed. That was a Meaningful Moment for my life. One I will savor. This article originally appeared in the November 2011 issue of the Mountain Monthly.